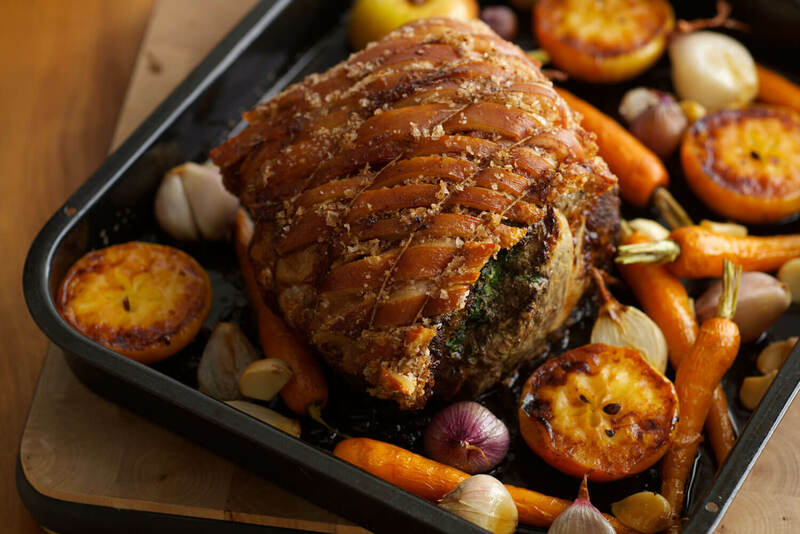 Roast Rolled Shoulder Of Pork | Packington Free Range | Born and reared outdoors. Always. The Pork Shoulder will crisp up under the heat, leaving you to get on with preparing a medley of root vegetables and apples to make for complimentary perfection. Once roasted and on the table expect the meat to elegantly fall off the bone, finish with an earthy pour of mustard and cider gravy. Remove the pork from the fridge 2 hours before cooking to allow to come to room temperature. Discard any packing and cover with a clean tea towel. Preheat the oven to 190 C/Gas Mark 5. Crush 2 cloves of the garlic and place in a food processor or liquidiser with the spinach, thyme and sage and blend until roughly chopped and well combined. Stir in the breadcrumbs and seasoning. Push the mixture into the meat. Place in a large enough roasting tin to hold the meat and vegetables. Check the skin has been scored, if not, using a sharp knife score the skin all over. Rub the salt and vinegar into the scored skin. Calculate cooking time allowing 25 minutes per 450g/1lb plus 25 minutes and roast. Meanwhile peel the shallots and wash the carrots. Remove the pork from the oven 45 minutes before the end of cooking time, skim off most of the fat and then scatter the remaining garlic cloves, shallots and carrots around the pork. Sprinkle over sugar and continue roasting for a further 30 minutes. Add the apples and continue roasting until when the pork is pierced with a knife the juices run clear and apples are caramelised. Remove the pork from the oven and transfer to a warm serving plate. Cover with foil and allow to rest for 20-30 minutes. Using a slotted spoon, transfer the vegetables and apples to a warm serving plate, leaving a few cloves of garlic to crush into the pan juices. Keep warm. Skim most of the fat from the roasting pan and discard. Scrape the meat juices in the pan together and mash and the garlic. Place over a low heat and blend in the cider and mustard. Bring to the boil and continue boiling gently, stirring occasionally until reduced slightly. Season to taste. Serve the gravy with the pork and vegetables.